So as the title says, I’m looking a for another species of lumber to contrast with Bubinga. 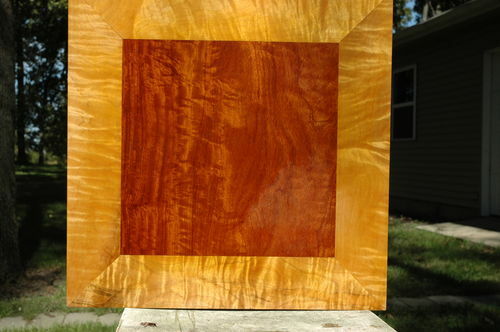 I’m looking to make the Bubinga as my dark and I need a light lumber to go with it. I’m open to hearing darker lumber to go with Bubinga, but I’d prefer a light lumber. What do you guys think of Bubinga with Maple? You may wish to go to the http://www.woodfinder.com website and select the library button. This will give you access to a variety of woods. Click on a species and you will see its’ color. I love it. the gold hue is due to the use of Garnet shellac I used for the french polish. I’ve used red oak and maple with bubinga and they both look good. Really depends on the bubinga, ie. burl, or flatsawn or what? I like white oak with bubinga an example of which may be seen here.